As per my Swedish cookbook, this is called the Royal Court dessert from the end of 1800s! But now much more popular since many many years! In fact, it looks great and tastes like a sweet cloud! Incredibly, it is much easier to make than you think!! If you like this kind of soft and fluffy dessert, wonderful glossy foam mixed with meringues, chocolate and fruits this recipe is perfect. Every berries, oranges, mandarines, will go perfectly well with the soft meringue! We had it for Easter Day in the traditional Swedish way (I diligently followed the Swedish cookbook) served with slices of banana quickly made at the end of the meal!!! In hurry to make it very good I forgot the sliced almonds, still it was a real… ‘royal‘ hit with the guests! You will need a large round flat serving plate for the pyramid shape. Using possibly a large glass or metallic ultra clean container clean, beat with an electric beater, egg whites with cream of tartar until soft peaks form. Gradually add teaspoon by teaspoon superfine sugar, 1 pinch of salt, continue beating till soft, glossy stiff peaks are formed. 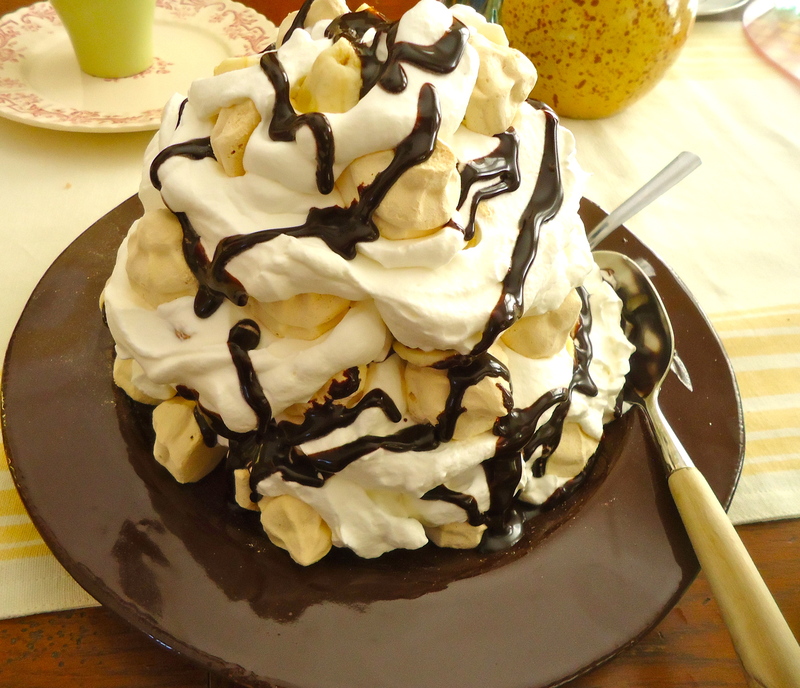 On your serving plate, lay a round base of meringues, add whipping cream and banana slices, in layers, till to a pyramid shape, swirls in chocolate sauce, sprinkle with almonds. Top with a last meringue and serve immediately! !Really too good to be true!! !